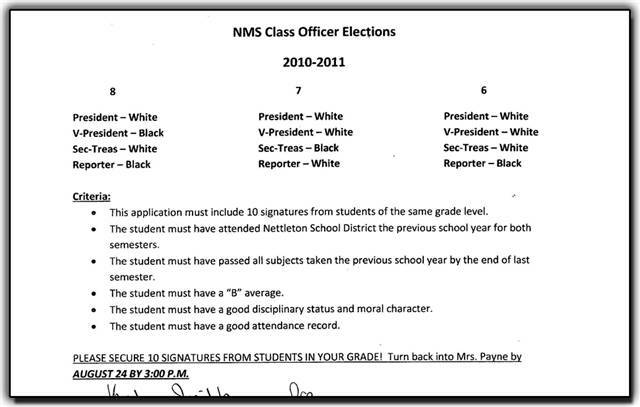 The school board in Nettleton, Miss., voted Friday to reverse its policy under which race determined whether a candidate could run for class positions, including president. 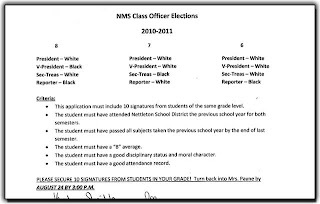 According to a memo sent home with students last week, African-American students could not run for class president in Nettleton Middle School this school year. However, the board voted at an emergency session Friday to drop that policy, according to Craig Ford, a reporter with the NBC News affiliate WTVA, who attended the meeting. According to the district's statement, the practice had been in use for more than 30 years with whites and blacks rotating among offices annually. "It is the belief of the current administration that these procedures were implemented to help ensure minority representation and involvement in the student body," Superintendent Russell Taylor said in a statement.